Heat oven to 400°F. Spray 9-inch glass pie plate or deep-dish pie plate with cooking spray. In small bowl, toss potatoes with salt and pepper. 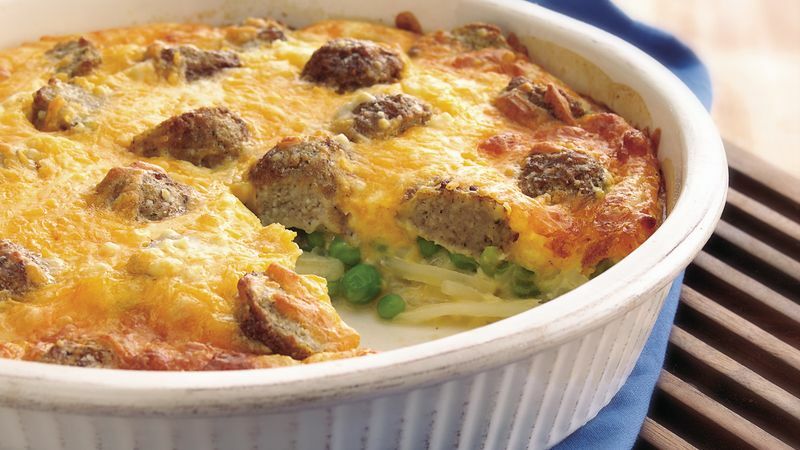 Layer potatoes, peas, meatballs and cheese in pie plate. In medium bowl, stir Bisquick mix, milk and eggs with fork or wire whisk until blended. Pour into pie plate. Bake 30 to 35 minutes or until center is set and top is golden brown. Let stand 5 minutes before cutting. Frozen meatballs are available in a variety of flavors. Plain meatballs are used in this pie, but Swedish meatballs with subtle spices and Italian meatballs with a heartier flavor can also be used. Thaw the meatballs overnight in the refrigerator, or use the Defrost setting on your microwave to quickly thaw them. The standing time for this pie, like many egg-based dishes, allows the pie to set up before being cut.